If you follow my Facebook Portfolio page, you know that I had a hair treatment at Smooth & Straight Salon over a week ago. I was really amazed with the result but I was holding this post for the past days because I want to see if the effect of the treatment really lasts. 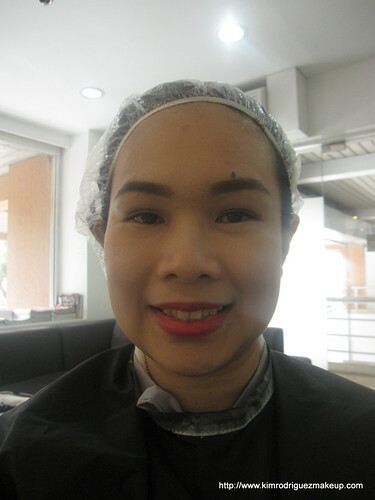 Now I'm ready to tell you how my vist at Smooth & Straight Salon went. I was born with straight hair. 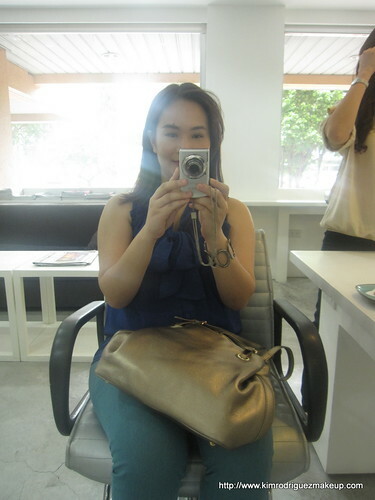 But during my mid-20's, I experimented a lot with my hair which made my hair dry, wavy and frizzy. It's still the same now especially after giving birth, hair care and salon trips were less prioritized. But I promised myself to get a hair trim at least once every three months after getting this hair makeover. In the photo above, I was resting a bit as I was out the whole morning before going to the salon. 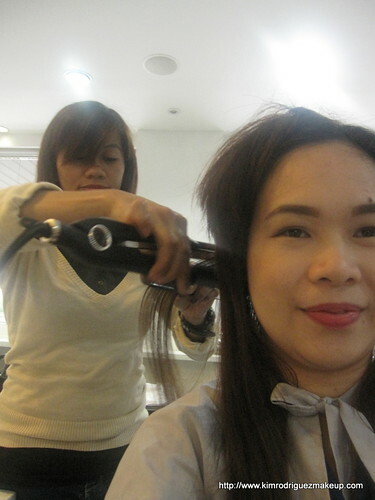 This is Ms. Hondy, the head stylist of Smooth & Straight Salon. After assessing what treatment my hair needs, she told me that the Macadamia Straight Wear is the perfect treatment to revive my hair. I like that before the treatment, I was educated by Joy of the benefits and what to expect of the treatment. She also gladly answered all my queries as this treatment is new to me. Macadamia Natural Oil is made of Argan Oil and Macadamia Oil. Argan oil is rich in Vitamin E and Omega 9 which helps damaged and over processed hair. It also helps abused hair which have been exposed to heat and pollution. Onthe other hand, Macadamia Oil is rich in essential fatty acids and natural antioxidants. It has the same almost the same qualities of the oil found in our body which is why it is easily absorb by the hair. 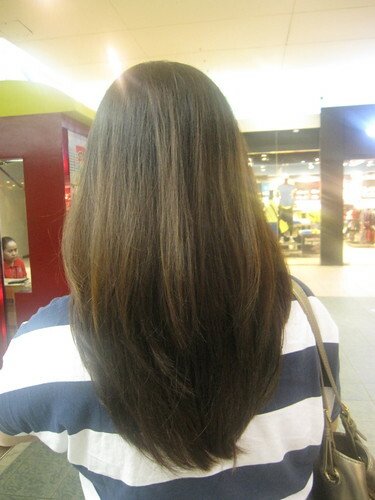 Straightware by Macadamia Natural Oil provides Healthy Formaldehyde FREE Hair Smoothing Therapy that lasts up to 4 months. It has the special blend of Macadamia Natural Oil combined with Quinoa seed and Gingko Biloba that revitalizes hair. It improves moisture and strength, transforms curl and frizz into smooth silky hair. It also intensifies color and shine of the hair. We do not recommend for it to be used on pregnant and or nursing women or clients that are experiencing brittle and/or hair loss. It can not be used on clients that have level 6 colored hair (very light color), bleached hair and gray hair. This is their shampoo area. 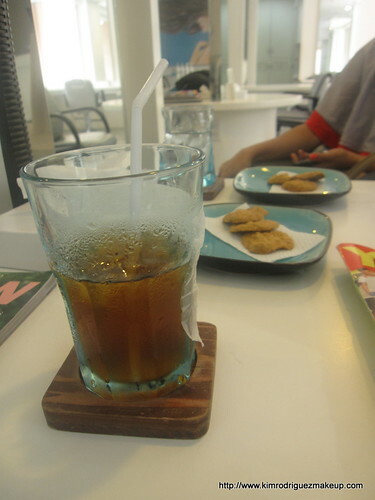 I like it's simple, clean and straight-forward feel (the salon over-all). My hair was shampooed using Straightware Purify Shampoo in order to remove the impuritiesand prepare the hair for the Smoother application. Then, my hair was towel-dried up to 50%. Without rinsing, my hair was blow-dried up to 100%. Then they ironed it to seal the treatment. And the result is shinier, oh-so-soft and lighter hair. It also made the color of my hair more visible. I like that my hair is so straight now but with volume. For after care, I was asked not to shampoo for 3 days, blowdry and iron once if my hair gets wet accidentally, no pins, no ponytails, no tucking of hair on the ears, and I was given a travel-sized Macadamia Natural Oil Rejuvinating Shampoo and Macadamia Natural Oil Moisturizing Rinse Conditioner which are both color safe, paraben-free and sulfate-free to maintain my Straightware treated hair. Earth also had her treatment that day. 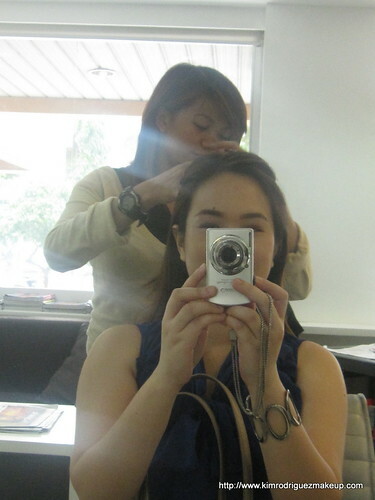 I was happy she was there too because it was like a salon-trip with a barkada. We chatted the whole time. 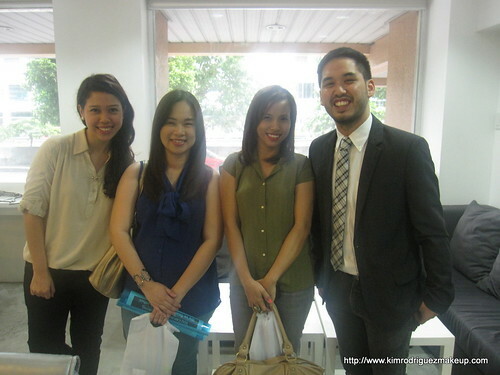 We were with the people behind the Zulusibs Inc., Ms. Joy Sison and Mr. Jaton Zulueta, on the photo above. Zulusbs Inc. is the sister company of Piandre Salon. They supply high-end beauty products in the Philippines and two of their flagship brands are the Keratin Complex by Coppola and the Macadamia Natural oil. 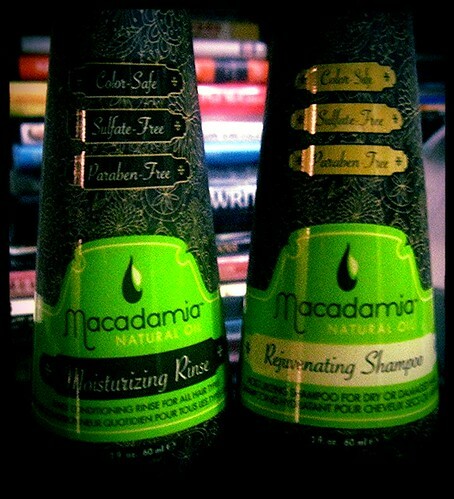 My after care: Macadamia Natural Oil Rejuvinating Shampoo and Moisturizing Rinse. 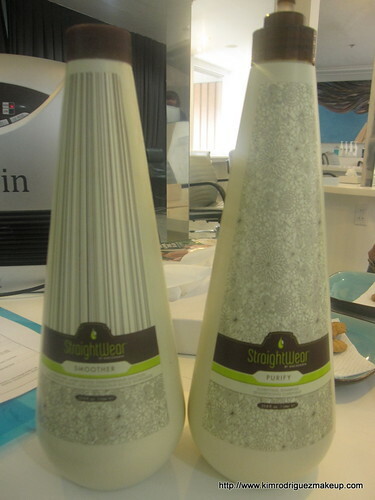 I was using these two ever since the treatment. They're color-safe, sulfate-free and paraben-free. The scent is divine. It's so good but not over-powering. Try it and you'll find yourself wanting to shampoo more than once a day haha (that's just me). My hair after 6 days. It's still straight but bouncy :D It's soft and easy to comb too. What I like most is that it cured my dandruff. I've been suffering from it for a month already (I think) because I used the same shampoo for two consecutive weeks which resulted to dandruff (it was my problem ever since). I don't know if the Macadamia Natural Oil is supposed to do that but it did and I'm so happy :D What's also great is that the treatment process was also fast with a longer result. 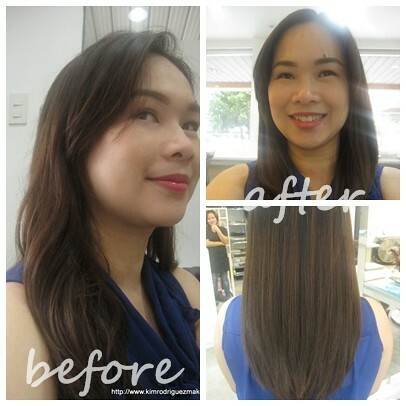 Straightware Treatment starts at Php3,500-4,500 for short hair; Php5,000-5,500-for shoulder length hair; and Php6,000 and above for longer hair. It's now available in Straight and Smooth Salon, David's Salon Ruby Road, David's Salon Stana Grove, Famous Salon at Ermita and Piandre Salons. If you want to set an appointment at Straight and Smooth Salon, here's the no. to call 759-5105. 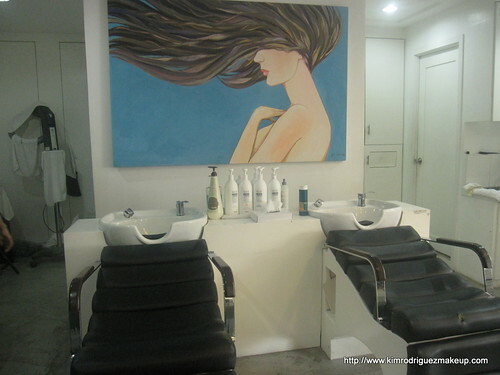 It is also located at G/F Vernida I Building, Amorsolo St., Legaspi Village, Makati City.